— Ed Cooley after LaDontae Henton scored 26 points and grabbed 14 rebounds in Providence’s 80-74 victory over Seton Hall in the 2014 Big East Tournament semifinals. Henton’s terrific night has gone a bit forgotten during this current stretch of five straight NCAA tournament appearances under Cooley. 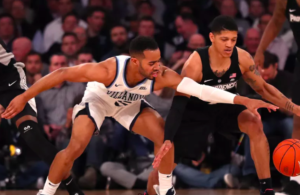 Without his big effort on a Friday night in the Garden the streak doesn’t start until 2015, Bryce Cotton never has his heroic March, and the school is still waiting for its second Big East title. This was Henton’s night from the start. He scored on three or four straight possessions in the first half, and knocked down dagger after dagger in the second. He shot 9-13 from the field, 4-8 from 3, and made a back-breaking and-1 with under a minute to play. Seton Hall wasn’t supposed to be here. They entered the Big East Tournament sub-.500 overall, but shocked #3 Villanova in the quarterfinals on a buzzer beater by Sterling Gibbs. The Hall had talent, they lacked depth. Gibbs was a tough, scoring point guard. Fuquan Edwin was one of the best two-way players in the country — a well above average scorer who was named Big East Defensive Player of the Year, in this, his senior season. The potential matchup problem for the Friars, however, was big man Gene Teague. The 6’9, 270 pound center shot over 60% from the field in 2014. He scored 17 points and grabbed 12 rebounds in his only game against PC that year (he missed the Hall’s double OT win at PC in January). Teague had double doubles against both Butler (14/11) and Nova (19/12) in the Hall’s first two Big East Tournament games. Veteran Experience: The Friars simply couldn’t shake Kevin Willard’s club, despite shooting well and playing at a comfortable pace offensively. No matter how hard Seton Hall pushed them, the Friars didn’t break. Henton, Cotton, Kadeem Batts, and Tyler Harris took turns making big shots in the final ten minutes. 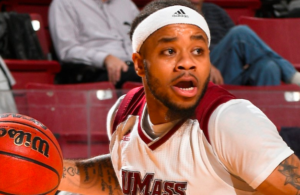 Balance: Henton was terrific, but PC also got 18 points and 11 assists from Cotton. Harris scored 14 of his 17 points in the second half, including three huge shots in the final 12 minutes. Batts and Carson Desrosiers were both in foul trouble throughout in trying to handle Teague, but Batts drew Teague’s fourth foul on a tough and-1 late. If you remember seldom-used Brice Kofane being highlighted by Fox for his strong first half play, you have a better memory than this writer. 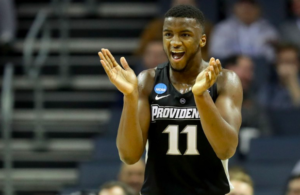 Dunn in Sweats: It’s almost hard to believe, but we saw a backcourt of Kris Dunn and Cotton for a handful of games in November 2013 (including a thrilling comeback win over Vanderbilt in the Virgin Islands) before Dunn underwent another shoulder surgery that ended his season after a handful of games. He can be spotted going wild from the bench in the video below. Pick and Roll Game: Time and again, PC beat the Hall with pick-and-pops featuring either Cotton and Batts or Cotton and Henton. Cotton shot just 5-14 from the field, a day after going 1-10 against St. John’s in the quarters, but his star was about to ascend higher against Creighton the next night and in the NCAA Tournament versus North Carolina. He made so many plays out of pick-and-pop situations on this night. 1. 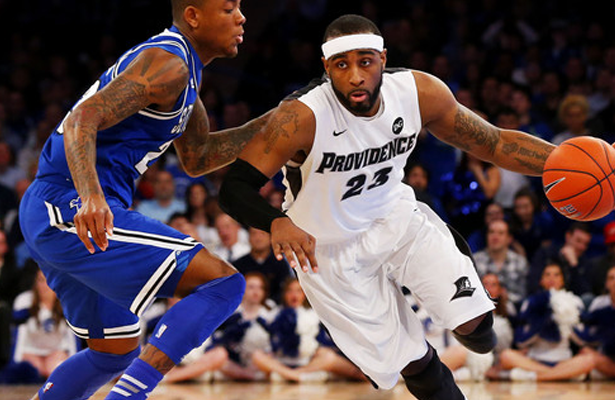 With about six minutes remaining in the first half the Friars were surging. They’d gone on a 12-0 run when Jaren Sina was met at the rim by both Kadeem Batts and Brice Kofane. The duo pinned his shot against the glass in a statement from a veteran group playing with desperation. 2. PC led by double digits in the second half before the Pirates sliced the lead to one with just over 13 minutes left. Harris countered by banking in a short shot and then Henton buried a killer 3 on the next possession to push the edge back to six. 3. Despite playing well, Providence’s lead hovered around 5-6 for about five minutes. That’s when Henton knocked down 3-pointers on back-to-back possessions to push the edge back to 11 (Dunn’s celebrations on the bench are an added bonus). 4. Cotton froze his defender with a hesitation and finished on a difficult scoop down the stretch. Bill Raftery threw out an Iverson comparison for good measure.